Stay In, Save Time, Eat Vegan! This brilliant cookbook reveals the secrets to cooking dinners that you crave— the kind that comfort, nourish and inspire you, without a ton of work. With every recipe clocking in under 30 minutes (prep included! ), anyone can enjoy incredible plant-based meals every night of the week. Fabulous recipes like Roasted Cauliflower Romesco Tacos, Spicy Buffalo Tempeh Wraps or Date Night Truffled Mac ‘n’ Cheez mean you can cut back your restaurant spending by making your own photo-worthy dishes at home. Megan Sadd has your back with smart tips for cooking efficiently, and a recipe for every mood you may find yourself in. Many of these amazing meals are gluten-free to boot, helping you maximize healthy eating in as little time as possible. These vegan dinners will satisfy the herbivorous and the omnivorous (and not just on Meatless Monday)! Whether you’re craving Jerk Lettuce Wraps with Caramelized Pineapple or Texas-Style Chili with Cashew Sour Cream, these easy plant-based dinners are more than salads and stir-fries—they’re fun, fast and scrumptious. 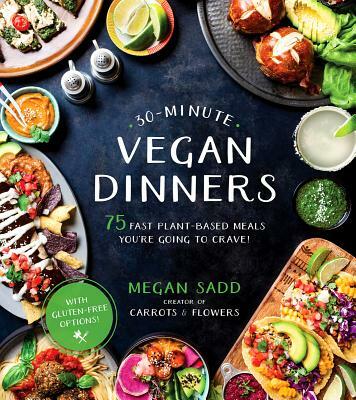 Megan Sadd is the recipe developer and photographer behind Carrots & Flowers, a crowd-pleasing plant-based food blog and Facebook video channel. Her work has been featured by Thrive Magazine, Cook Vegan Magazine UK, Buzzfeed and Huffington Post. She lives in Los Angeles, California. Follow her on Instagram @carrotsandflowers. “This beautiful book features vibrant, delicious, plant-based recipes to help nourish your healthiest self—creating lasting effects on the mind, body, soul and environment.” —KIP ANDERSEN, award-winning director of Cowspiracy and What the Health?